Peter Miller is a nationally-renowned, 2 Time Emmy nominated television host. He is also a producer, spokesperson, philanthropist, professional angler and three-time world sailfish champion. Most widely known for his 7 Telly award winning television show, Bass 2 Billfish with Peter Miller, which appears weekly on NBC Sports and the World Fishing Network. An expert fisherman by trade, his lifelong passion for the ocean has garnered him multiple awards and sponsorship deals with leading outdoor and lifestyle brands, as well as the opportunity to appear alongside various celebrities, including Arnold Schwarzenegger, Christian Slater, Pitbull, Kevin Hart, Patrick Dempsey, Lebron James, and Ice Cube for philanthropic and promotional efforts. Originally from Tappan, New York, Miller has solidified his career on the shores and waters that have made Miami famous. Raised in the Northeast, Miller initially moved to Miami to earn his marketing degree at the University of Miami. While pursuing his professional interests, the avid fisherman founded his award winning “Get Lit” fishing team, with which he would go on to win or place in more than 120 high profile billfish tournaments, including three World Sailfish Championships. 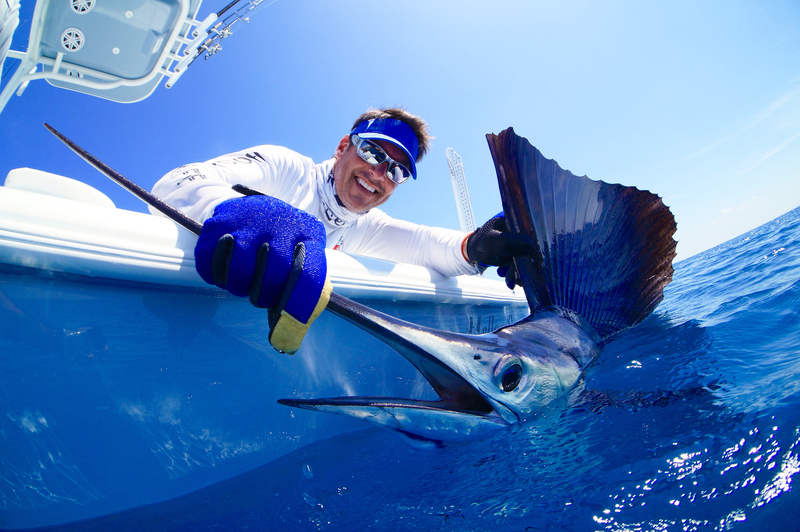 Additionally, Miller has won top angler in sailfish, marlin and swordfish events. Miller’s success on the water quickly paired with his natural ability as a brand ambassador, eventually gave him the clout to develop his own television show. When he’s not offshore, Miller spends his time in front of the camera, endorsing over a dozen brands, including Florida Tourism, Bass Pro Shops, Monster Products, Tire Kingdom, Mercury Marine, Laser Spine Institute, YETI coolers, Salt Life, and Costa Sunglasses. Widely regarded as a social influencer on Facebook, Twitter and Instagram, Peter has a combined social media presence of over 500,000+ followers and over five million views on YouTube. Additionally, the fisherman turned celebrity has the Top 50 Twitter account in the fishing industry. Appearing in both print and television, Miller has transcended the niche fishing market to become a widely regarded personality for his undeniable good looks, natural charisma, and comfort with public appearances. Most importantly, Miller is an outspoken wildlife and environmental conservationist, working closely with the Everglades Foundation, Captains for Clean Water and the Florida Fish and Wildlife Foundation; through his efforts, these organizations have been able to raise multiple millions of dollars for conservation. Furthermore, Miller has collaborated with local and national philanthropic organizations, including Make-A-Wish Foundation (having granted 6 wishes to date), Wounded Vet organizations and the National Down Syndrome Society. Most recently, Peter produced a national TV commercial for Monster Audio. Bass 2 Billfish with Peter Miller won 7 Telly Awards and Peter is now a 2 Time Emmy Nominated T.V. host of Bass 2 Billfish with Peter Miller. More than a mere fisherman, Miller is a man for all seasons, an unparalleled brand ambassador, and a genuine family man. He currently resides in Miami, Florida and enjoys spending his time with his two children, classic cars, playing the Djembe and paddle boarding.